MANILA (UPDATE) - At least half of Filipinos are in favor of making drug tests mandatory for Grade 4 students and older pupils, a survey released Wednesday showed. Grade 4 students are usually around 10 years old, data from the Department of Education showed. Fifty-one percent of 1,500 adults agreed with the proposal, 36 percent disagreed, while 13 percent were undecided, the Social Weather Stations (SWS) survey showed. The proposal was most welcomed in the Visayas, where 69 percent of respondents agreed, followed by Metro Manila (53 percent), and Mindanao (52 percent). Respondents from Luzon were least receptive to the idea with only 41 percent supportive of the proposal. "Agreement with the proposal was highest among those who are satisfied with the performance of President Rodrigo Duterte," the SWS noted. Education Secretary Leonor Briones and former Presidential Spokesperson Harry Roque earlier said they would not support the proposal to conduct mandatory drug tests on students in 4th grade and higher as the Dangerous Drugs Act only allows for random drug testing for students of secondary and tertiary schools. With 14 million students from Grades 4 to 12, drug testing would cost P2.8 billion, the Department of Education said. Fourth graders are at least 10 years old. Panelo, however, welcomed the idea, adding that some parents might also approve such. “I think that’s a good idea because at least the parents will know whether or not their children are addicted or being used in the drug industry,” Panelo said. The same survey also showed that respondents gave a “very good” +64 net satisfaction score to the administration’s campaign against illegal drugs. Government's drug war had drawn criticism from local and international rights groups and foreign governments over alleged extrajudicial slays, but officials have denied involvement in such cases. Administration officials have many times said those slain in police anti-drug operations had violently resisted arrest. “That is expected because at the inception the President believes that the majority of the Filipinos are - if not [an] overwhelming majority - support his drive against drugs and criminality as well as corruption,” Panelo said when asked to react on the government’s rating. 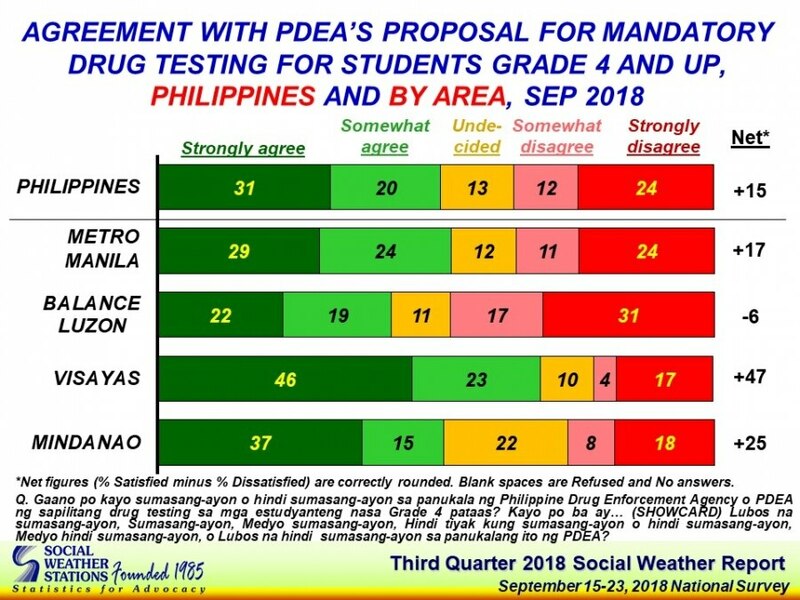 The survey was conducted 3 months after the Philippine Drug Enforcement Agency (PDEA) said it would push for mandatory drug testing among teachers and students in Grade 4 and up.